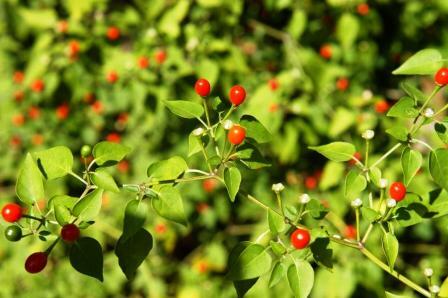 Common Names: Texas Bird Pepper; Bird Pepper; Pequin, Tepin, Petin, Chiltepin, Bird’s Eye Pepper, Turkey Pepper. Originated in Central America, very hot, often 7 – 8 times hotter on the scoville scale than jalapenos 30,000 – 60,000 units. Perennial in many parts of the south. If the soil doesn’t freeze hard in your area, you can probably grow these peppers as a perennial. It will freeze to the ground but return in the spring. 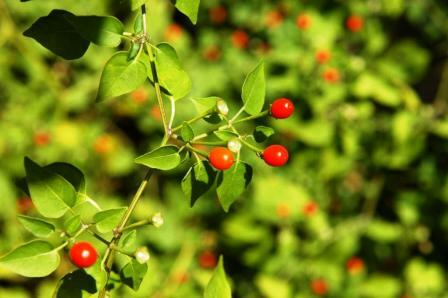 The bright green pointed leaves and the green-to-red fruit make an attractive plant for herb garden or landscape border. Location: Full sun or part shade and requires almost no care. Able to survive drought and flood, little fertility, birds do love these peppers. Culture: Easy to grow from seed. Uses: Can be used in place of any hot peppers in recipes. The commercial hot sauce brand Cholula lists bird peppers as one of its ingredients. Popular for use in pepper vinegar. Clean a previously used or new pepper shaker bottle with boiling water. Fill the bottle with chilies. Heat the vinegar in a small saucepan over low heat until it steams slightly and put vinegar over the peppers to the top of the bottle. Allow to sit for a few days before using. Can be refilled with vinegar several times. Keep refrigerated. Attracting mockingbirds – they eat the small peppers like jellybeans. 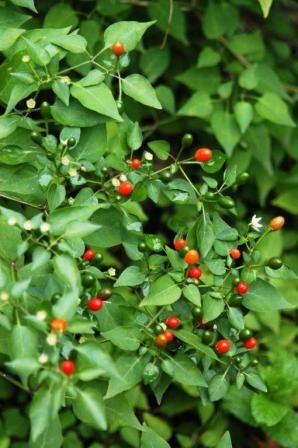 Note: Thomas Jefferson first obtained seed of the Bird Pepper in 1812 from Captain Samuel Brown, who was stationed in San Antonio, Texas. Jefferson recorded planting this pepper in pots and in the kitchen garden in 1814.